This statement is what inspires our Kenya Communications and Partnerships Manager, Jerry Sellanga every day. The knowledge that there is always a new challenge to master and excel in. Jerry holds a Bachelor’s Degree in Environmental Studies (Community Development) from Kenyatta University. Having had a lifelong interest in communications and graphic design, Jerry landed a job as the Communications Officer at Wanda Organic Limited, an agro-input company in Nairobi. 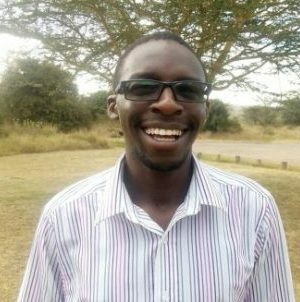 After working there for two years, Jerry transitioned to Ol Pejeta Conservancy in Nanyuki, Kenya as the PR and Marketing Coordinator. After several years in that role, he was promoted to Social Media Coordinator, managing the digital presence for the company and its various sub-brands. Spurred on by the desire to use his talents and skills for societal good, Jerry joined Amani in November 2018 and is enjoying the challenge. Outside of the workplace Jerry is an ardent sports fan, especially football and basketball. He also has a huge interest in music, film as well as technology.